LOU FERRIGNO VS. WEIRD AL YANKOVIC. Weird Al ends up winning. But who cares, Ferrigno already won the moment he put the blue Double Dare polo shirt on. There’s just way too much to love about this show. First of all the prizes, which in this episode include a tropical island vacation, VCR, Chevy S10 Blazer and a Funk & Wagnall’s 29-volume Encyclopedia & Dictionary set! Maybe i’m out of touch, but why did the desire for encyclopedia collections decline over the years? It’s a lost art, that’s for sure. 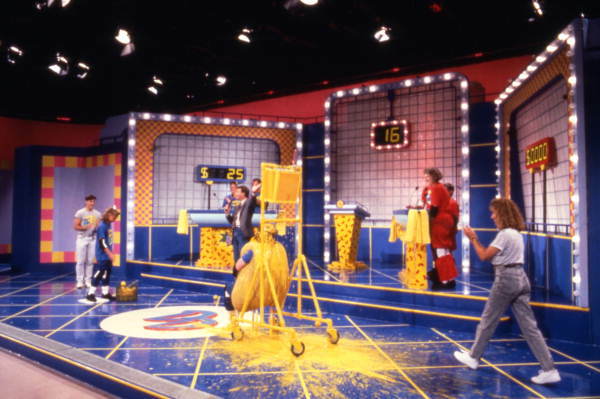 More great elements of Double Dare include the gigantic waste of food, psysical challenges, the squeakly-clean blue flooring, Marc Summer’s flawless voice/unbelievable delivery and lastly, THE MUSIC. What could be more pleasing to the ears than the combined powers of Marc Summer’s voice over multiple Double Dare musical themes? My all-time favorite stop in the obstacle course was the GIANT EAR. Nothing seemed more fun than trying to find a little red flag in a walk-in, waxy ear. Share your favorite episodes and memories of this timeless TV spectacle on the TNUC Facebook page. ← LE MATOS PRESENT ‘MOLLY’. One of the best shows growing up as a kid. Nickelodeon needs to bring back these classic shows to show our future generation what being a kid was all about. Salute Your Shorts, Double Dare, Family Double Dare, Hey Dude!, & Wild & Crazy Kids.